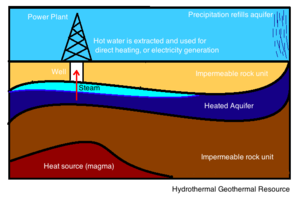 Hydrothermal fluids may be lithologically controlled as is the case in the Salton Trough region where sandstones often lack cement (due to certain properties of the local hydrothermal fluid) allowing for increased permeability, capped by less porous shales. Want to add an example to this list? Select a Geothermal Resource Area to edit its "Controlling Structures" property using the "Edit with Form" option. This page was last modified on 12 April 2017, at 11:00.